﻿ Full False Treads | Scotia Stairs Ltd. This unique product the full false stair tread cover allows the DIY’er to accomplish that look they long for without doing a total staircase tear out. This is a great solution for those beat up basement stairs or for any stairs that you wish to re-tread, without doing a full tear out. Our full false stair tread is designed to go over an existing tread ( it’s actually a ‘Solid Cap Tread’ ) so this product is the perfect solution for renovation jobs. 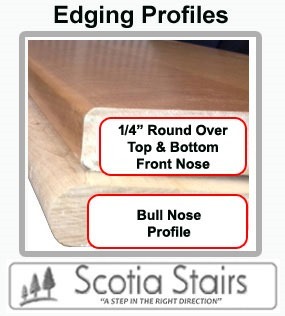 The body of our replacement stair treads is a full 3/4 inches thick ( not the thin 1/2 inch false treads that are being sold on the market ) while the nose is a full 1-1/16 inch thick. The full 3/4 inch body of our false stair tread makes for a more solid and life long lasting stair tread, which will with stand the stress of everyday use. Our false stair treads are made from 4-7 pieces of solid hardwood lumber, edge glued together so this wards against cupping or wrapping. Our false stair treads are manufactured to meet and exceed industry standards and stand the test of time ( they are not veneer top or not press wood core or not one piece ). WE OFFER ONLY SOLID CANADIAN HARDWOOD! Our tread caps all have “full one piece solid bullnose that is approx. 2-1/4 inches wide”. Why is this so important you ask? By us actually incorporating the bullnose into the the body of the tread itself, it means the bullnose of the false stair treads we manufacture, are fully supported by your base sub-tread. Thus the nose on our tread caps will never / ever rip or tear off, as we do not just slapped a bullnose front on the very end of our 3/4” tread body ( so it will never / ever come loose or unattached over time ) THIS IS KEY! Three (3) Bullnose Types: 1-1/16″ standard round bullnose, 1-1/16″ square bullnose with slight 1/8″ round over on top and bottom, 1-3/4″ oversized modern square bullnose with slight 1/4″ round over on top and bottom. Note: We can do round over or leave the nose full square, but we recommend against this as finish is prone to chipping or will wear off a full square sharp edge, ( either 1/8” or 1/4″ round over is recommended depending on product choice and required to warranty our spray booth finish ). “New Homes & Renovations Consumer Publication” : The Full False Replacement Stair Tread A Unique Product Made For the DIY’er. We can make our false treads to almost any size you may need ( so, if you find that your run is more than 9″ or you need them 96″ long, this is no problem for us ). Many consumers are under false assumptions that a stair tread made from 4-7 pieces of hardwood lumber is not as good as a stair tread made of one solid piece of lumber… this is very, very far from the truth. A stair tread made from only 1-2 pcs. of hardwood lumber has very little strength and/or structural integrity against cupping or warping and fails to meet industry standards. Thus, we will not stock one piece stair treads and we don’t manufacture them! Each stair tread will have to be trimmed to fit the stair tread it is capping… so all the full false treads may end up to be a bit different in size when installed ( like fitting a counter top to a wall, no two walls in your house are 100% true and neither is your staircase ). We recommend PL Premium Glue, this is the best wood construction glue on the market for securing stair treads. PL Premium Glue comes in a caulking tube, so it is easy to dispense ( PL Premium can be found at any hardware store, it is in a black and gold caulking tube ). Typically most “do it yourselfer’s” will put down an ample amount of PL Premium Glue on each stringer and then 3 ea. 2 inch face nails in the back of the tread, towards the riser. Then simply apply pressure to the tread face and continue on! With any high volume product in any market place, you must beware of poor quality fakes! Please note: some companies sell flat stock lumber with a bull nose glued on the very front edge, which easy gets torn / ripped off as it is the pressure point of where your foot meets the tread front. Even worse ‘Big Box Stores’ like: Home Depot©, Home Hardware©, Lowes©, Kent Building Supplies© and Rona© are selling veneer false stair treads with a press wood or a styrofoam core ( this is not a quality full tread cap and only offers the consumer a cheap, short lasting solution ). Our full false treads are made to meet and exceed stair parts industry standards, made to your fitting size needs, and made to last! 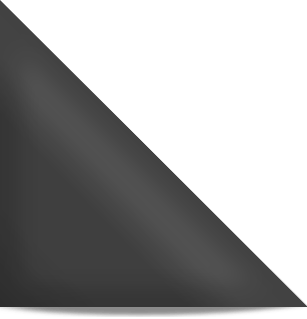 “Select & Better Clear”: a uniform color match face… with little color changes. “Select & Better Natural”: more color variations and color character in the treads face. We can pre-finish your hardwood Standard stair treads and risers order in our professional spray booth finish shop, so your treads are ready to install the day you receive them. From a natural clear coat, to a custom stain match to your flooring, or 1 of 25 MinWax© colors, when it comes to prefinished stair treads we cover all the bases. Visit our spray booth finish page here for details. Our solid modern false stair tread gives your staircase the appearance of having 1-3/4″ thick oversized stair treads installed. We simply offer this desired oversized look in the convenience of a replacement tread cap application ( so now you, the average consumer can install new treads yourself at a fraction of the cost of your local stair builder and get That professional install look ).